Coffee tables are often the first piece of furniture you want to look for when decorating your living room. As it is one of the most used and most common furniture, you can find hundreds of different designs and models that make it easy for you to buy one that compliments your overall decoration. You have an option to choose between materials like metal, wood, glass, and steel, but the most long-lasting coffee tables are those made of metal. These tables also look great in modern industrial decorations. However, there are some designs that can look great in any situation. One such model is the Hillsdale Marsala Coffee Table, which can add life to your living room. The unique and eye-catching design offers a great first impression on your visitors. In this article, we have reviewed this coffee table in detail with information about its features, benefits, limitations, and a comparison with another popular product. Let’s start with the manufacturer first. Hillsdale is a well-known U.S.-based brand founded in 1994. They are loved for their wide selection of furniture that ranges from simple stools to luxury beds. However, their most popular furniture line is their coffee tables, which are known for their unique designs. Among these coffee tables is the Hillsdale Marsala Coffee Table. The Hillsdale Marsala Coffee Table comes in a grey finish with rubbed brown accents. It is its perfect combination of metal and glass that makes it unique. The table offers you a metal stamp design that is covered under safety-tempered glass. What’s more is that this coffee table comes with a removable glass, which makes it rather easy to move around. You simply remove it first and move both the table and the glass separately. The open metal pattern under the glass top makes the coffee table look elegant and unique. You can easily put the glass on the metal pattern as it sits inside the rime just like an inlay. The grey finish is also high quality in that when combined with the brown accents, easily made the coffee table the center of attention in any room. The table provides you ample space, measuring in at 36 inches in diameter and 18 inches in height. With a circumference of 113 inches, it covers a significant area in your living room. The weight is around 49 pounds, which makes it easy to move yet comparatively heavy for its size. For those who are looking for a table that can last for a long time, the Hillsdale Marsala Coffee Table is the perfect option. It boasts an all-metal with a glass top placed on an open pattern that makes it sturdy and long-lasting. The grey finish with brown accents gives it a unique color that looks both grey and brown, with a feel of rusted lines in it. You may need to assemble some parts, but they are easy to do within minutes. It also provides you with enough space to put important stuff on the table. While it goes well with industrial décor, it can look good in any type of interior. Overall, it is one of the most durable and well-built coffee tables out there. When it comes to shopping for a coffee table, you can find a lot of options out there. Metal, wood, and glass are the most common materials used. Glass tables are often preferred due to their elegant look and clean design. One such option to compare the Hillsdale Marsala Coffee Table with is the Sauder Harvey Park Coffee Table. Both are similar when it comes to the diameter and design, and they both are available in a circular design with 36 inches of diameter. The Hillsdale Marsala Coffee Table is slightly higher at 18 inches compared to Harvey Park Coffee Table, which is only 16.5 inches high. Another major difference is in their design. The Harvey Park Coffee Table is available in black color with the clear/black glass surface. However, the Hillsdale Marsala Coffee Table is brown in color with a metal surface that is covered with glass. In terms of built, Hillsdale Marsala Coffee Table is much better with its use of high-quality, sturdy metal, but this also makes it heavier compared to the other table. This one weighs around 49 pounds while the Harvey Park Coffee Table weighs only 30 pounds. However, due to its sturdy construction, the one from Hillsdale will last much longer. This also makes it slightly expensive compared to the Harvey Park Coffee Table. If we compare brands, Hillsdale is also more recognized compared to Saude. However, both are U.S.-based brands and known for their high-quality products. All in all, if you have an eye for unique designs and you are looking for a long-lasting coffee table, then the Hillsdale Marsala Coffee Table is a good consideration. For those who are looking to add something in their living room that can go well with industrial decoration, the Hillsdale Marsala Coffee Table is the perfect option. 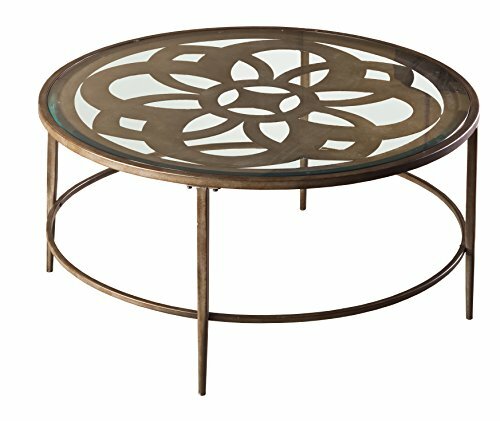 The 100% metal construction with a tempered glass top makes it a very attractive coffee table. It also provides enough space to keep a lot of things on the table for a family living room. With its height, it also provides just the right height that goes well with the height of sofas and chairs in your living room. The weight of the table is heavy, but this is what you can expect from a metal table. All in all, manufactured by one of the leading brands in the United States, the Hillsdale Marsala Coffee Table makes a perfect product to invest in. It offers you unique design and sturdy construction.